Like a moth to a flame I am attracted to anything quilted or padded. Not entirely sure when or how this happened but as I was looking through my wardrobe the other evening I saw I had quite a few quilted things. Maybe it's because quilted stuff just looks more luxurious, especially bags and quilting in clothing looks either very cozy or more 3 dimensional. 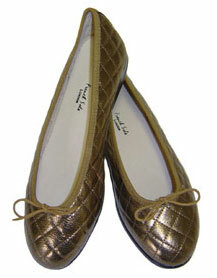 Whilst I'm not into ballet flats, I can do them if they are quilted like these French Sole ones. 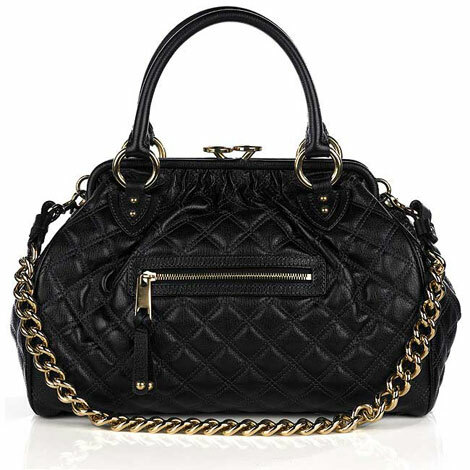 Clearly the epitome of luxury quilting is the Chanel bag but, as some of us have experienced, the Marc Jacobs Stam bag is also some pretty desirable quilting. 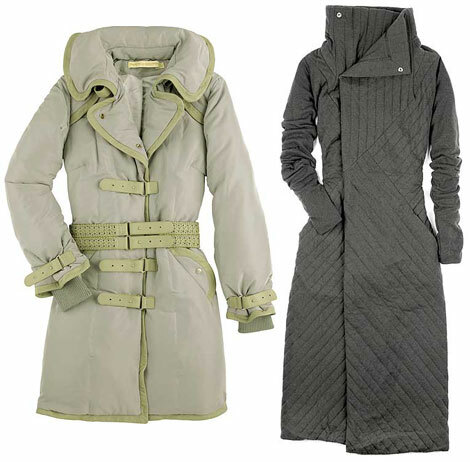 Loving these padded coats by Munthe + Simonsen and Rick Owens. How snuggly do they look? It would be like wearing a duvet! And I love LOVE how Givenchy have expanded the basic padded jacket by adding swathes of knitted collar and trim which make this look like the warmest jacket ever! The best quilting of all though has got to be my duvet, which is exactly where I'd like to be on this rainy windy morning! Mmmm, the answer may be yes! The Miu Miu wedges arrived earlier this week and are every bit as breathtaking as I had hoped. They are also very high, bordering on the vertiginous and very heavy. 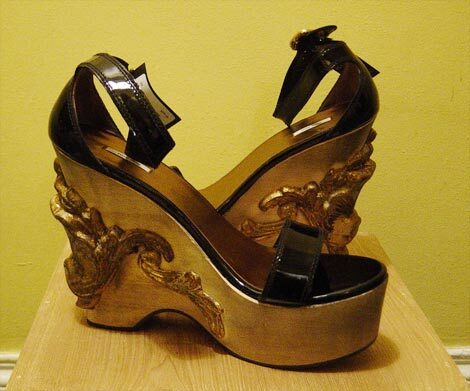 Previous to these new arrivals, my highest wedges were probably the Robert Clergerie ones I bought earlier this year. Neither of which, I am ashamed to say ,have yet seen any 'pavement action'. They are not alone there! I try to ignore the plaintive voices of the three pair of Prada Wedges I have stashed in the kitchen cupboards, begging to see some street!!! Put the Clergerie wedges beside the Miu Miu and all of a sudden they look like run around shoes, but no one could dispute the strange beauty of these lofty wonders. 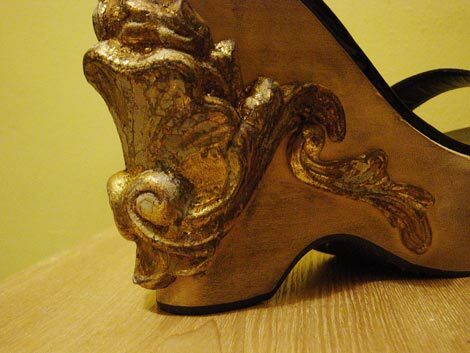 Looking closely at the heel detail you wonder if they were made by a shoemaker or a cabinet maker! So it's saturday night and their fate is still slightly in the balance ( ie I have not taken the tags off them yet!) but deep inside I know I don't have the heart to send them back. They are just too special! A Purse fit for a Princess? 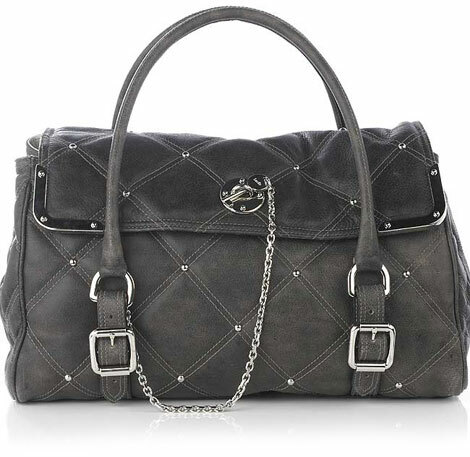 I spent yesterday afternoon trying to find a new handbag for Princess Laura, my niece. Heaven knows she is not short of them but she lost her favourite on friday and is heartbroken. She was with her mum, with a bag full of all her pocket money because she wanted to "look at new high heels"
Long story short she left her bag and purse behind in a shop and when they returned to the shop it was gone! 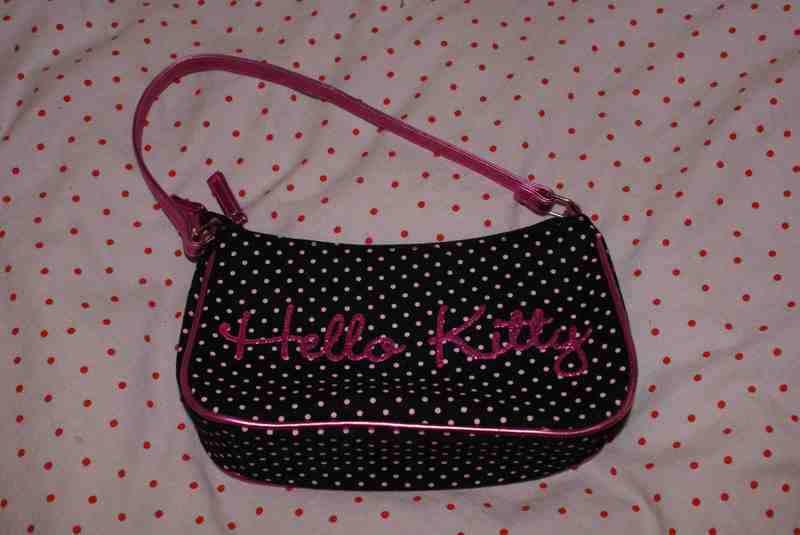 It was her favourite because her daddy bought it for her and there was room in it for her purse and her diary! (one of my old notebooks). Her diary! - she can't even write but carries a diary... it's probably got a shoe wish list at the back. 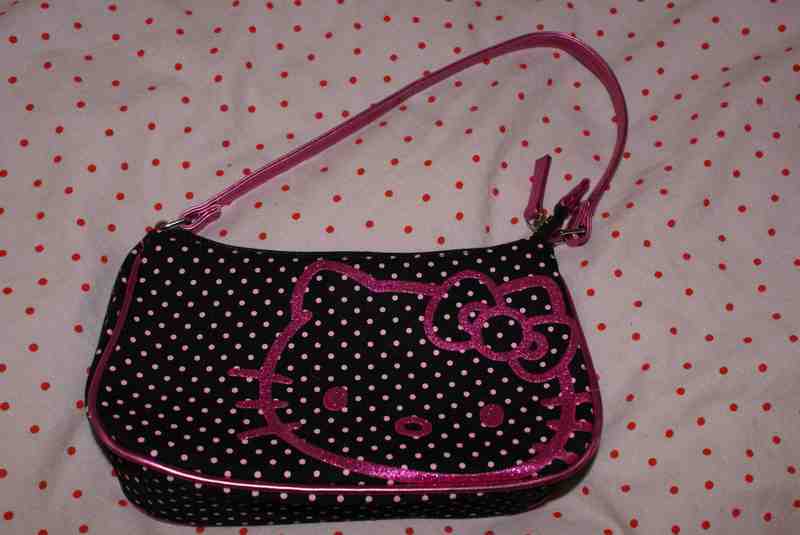 I finally found this one, it's pink and glittery, it could be a winner. All I need to get now is a new notebook and hopefully it will put a smile back on her sad little face. Will let you know her verdict later on and to the mean person who took her bag, you surely know karma is looking for you and is going to kick your arse hard! Trench Coats - I think not! As the end of the year approaches, we will soon be bombarded with advice of what to buy in the sales. And as always, the advice will be to buy well made classics that can be added to your existing wardrobe, along with countless column inches on how to build 'the perfect capsule wardrobe'. I hate that phrase almost as much as I hate trench coats. Now they can trawl out all the reference they like, they can even dig out shots of young Faye Dunaway and Catherine Denueve looking sleek and chic but I shall not waver. The simple fact is, that regardless of the colour or the quality, be it high street or burberry's finest, a belted trenchcoat will make anyone look like a big sausage with a bit of string tied round the middle. but my desire burns as bright as ever. That would explain the unexpected surprise I got from the Queen Mother last evening. The weather in the kingdom is shocking. It is cold, windy and has pissed of rain non stop for over a week. I wouldn't last a month in Seattle, I HATE the rain with a passion. As I type I am gazing at my warm snuggly feet. 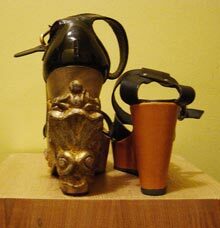 No they are not marni clogs but my mum came across them yesterday. There was only one pair, in my size. As she said they " were just sitting there waiting on you!" Everyone has their vices. I don't drink or smoke but holy moly can I drink endless cups of tea. To get the most from your tea drinking you should really be drinking from a bone china cup, not some hulking big stoneware mug. If your budget can stretch to porcelain so much the better. 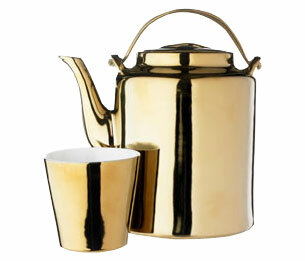 My last treat from www.conran.com is this delightful teapot and cup in regal gold. You too could feel like a queen taking tea this way. Having absolutely decided I'm too old and don't have enough by way of hips for baggy jeans I need an alternative to skinny jeans, which I still love but am getting a little bored of. 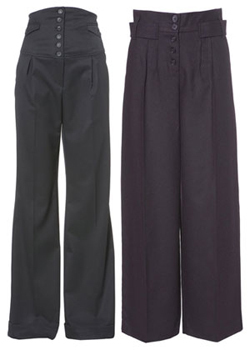 Therefore I have decided I'd return to baggy trousers as they are far more flattering on a slender frame and there is much more in the way of shapes and fabrics to choose from than when I first started wearing baggy trousers, which was many years ago. Back then I did it in an early 80's New York, hip-hop stylee, with 70's baggy, verging on flared, flannels combined with a vintage Adidas track top and Adidas pristine white shell toes. 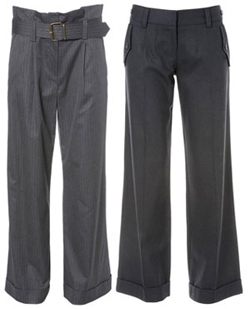 I tried the look again a few years ago with an amazing black and gold Puma bomber jacket I have, but baggy trousers were hard to come by so I had to make do with loose fitting suit trousers, which I bought in a couple of sizes too big, but that did not look good. Thankfully things have changed on the trouser front and now I can explore them again with some great shapes to play with. Topshop (again) have some exciting variations from the high waisted 40's style to loose fitting flannels and paper-bag waists. The fourth pair are particularly exciting me as they are so plain they could work with my Chloe shoes if I rolled up the hem or indeed a pair of trainers like any of my converse. I love the idea of the paper-bag waist too and the beauty of baggy trousers is that you can be as full on or as low key as you want. 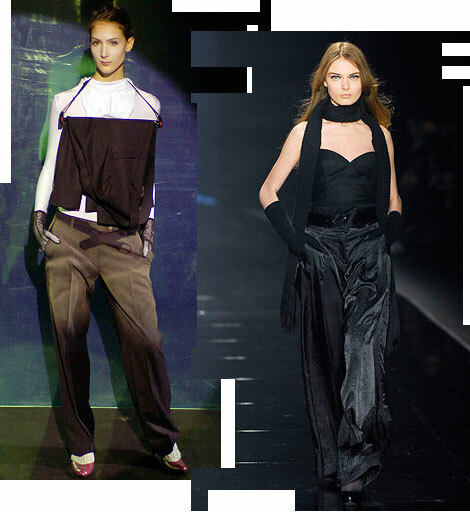 The way I want to utilise my trousers is to layer up with lots of sheer knits, jersey tops and lots and lots of asymmetry. I think Martin Margeila has the look down pat. The combination of all the elements and colours are perfect. Costume National's look would work so well with the corset style trousers - combining them with the tight fitting top, loose scarf and elbow lengths gloves is just gorgeous. I'd put a white t-shirt underneath and wear that look for day-time. Rick Owens, the master of volume and proportion, really knows how to make baggy work for the female figure without making it look like she's wearing her boyfriends clothes! I actually, shock horror, like the fact it's all black! But I do think all black works if there is a variety of materials and shapes used, so some sheer, some shiny, some long, some short, so there are lots of tiny details if you look closely. My belt bag used across he body would really compliment this vibe. 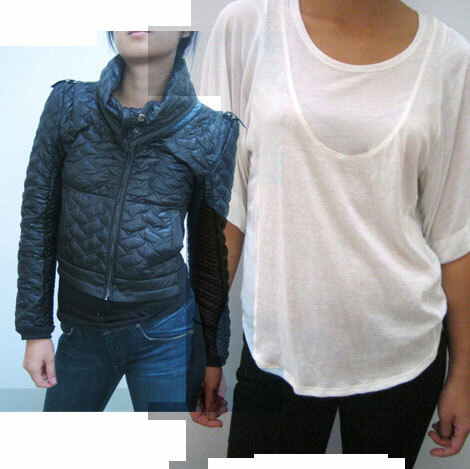 This jacket by Grey Ant and sheer t-shirt from VPL would work well with the baggy trousers too. So I'm off to explore Topshop this lunchtime and spend money I don't have on clothes i don't need. Does it get any better than that? 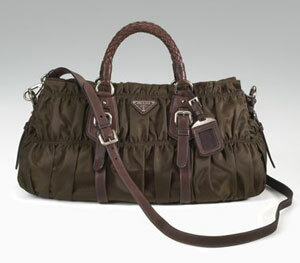 Prada nylon bags that is. I always quite liked the leather Gauffre bag (especially in olive) but I figured it was a bit too much ruching even for me, especially in leather, and the price of them was pretty hefty for me as I'm not a massive fan of Prada. But when I saw they were doing the style in nylon I figured it would look amazing and be much more reasonably priced as other Prada nylon bags are actually quite cheap (in the grand scheme of high end bags). Oh how wrong I was! This green version is a whopping $1745! That's a mistake right? Or has Muiccia been sniffing Pritt Stick? Is there an international nylon shortage I don't know about? 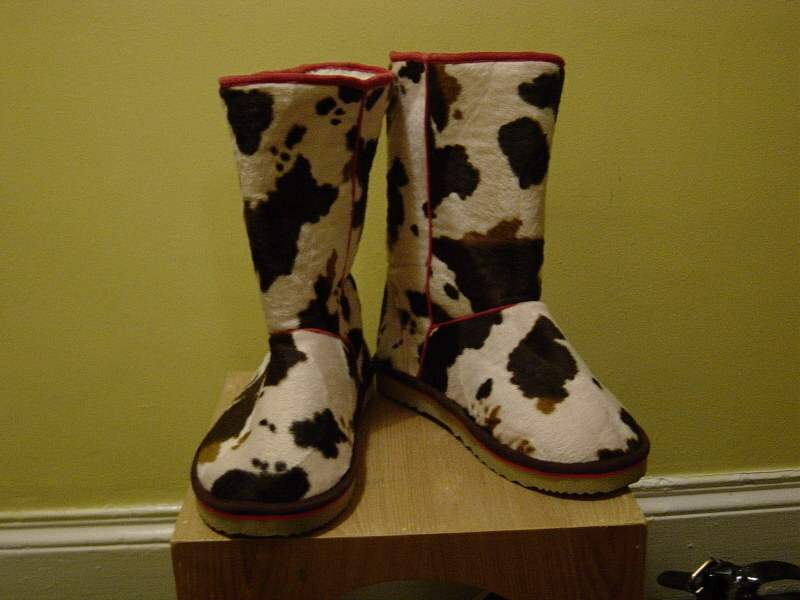 Maybe those wee bits of leather are actually from a super-rare leather making animal only found in Outer Mongolia which only produces this special leather but once a year? Whatever the reason, I shall not be paying well over 1000 of my finest British pounds. You can keep your nylon. ....some more stripes. This time courtesy of Jessica Ogden's A/W 06 collection. Big, bold, black and white. 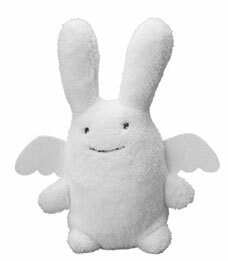 Cuter Than A Cute Thing!